Our design goal has always been to cross oceans in maximum comfort and safety while minimizing passage times. Now we’re taking a new approach to this process. For the past 20 years we’ve had clients asking us to do a highly efficient and safe power boat, based on the efficient engineering approach we’ve developed for our sailing designs. However, we were not ready emotionally to admit that we would consider going to sea on a powerboat ourselves. Time marches on, and we have found ourselves in a position where this idea of an “Unsailboat” begins to have appeal; hence this new series of ocean voyagers. The first of these yachts, Wind Horse, is shown here. In four years since leaving New Zealand this design accumulated 45,000 cruising miles. Maintaining high average open ocean speeds so as to be able to avoid dangerous weather, and make the most of favorable conditions. Good steering control downwind in big seas. Making progress uphill in breaking head seas while maintaining excellent maneuverability. Having a fallback mode in case the boat is disabled in dangerous weather. The ability to recover from a knockdown. All of the above have substantial benefits for normal cruising as well. We see no reason to cross oceans at a slower speed than that to which we are accustomed with our sailboats – which is considerably faster than the norm for the trawler type (as an example, the ketch Beowulf typically averaged between 270 and 300 miles per day on her ocean passages). This post is intended as an introduction to the detailed articles included in the FPB section of the site. The designs you will find on the following pages are a direct descendant of the yachts we’ve developed over the past 30 years. In terms of hydrostatics and naval architecture, these new designs are close sisters to Beowulf, Sundeer and Deerfoot II. The major difference is that we don’t require the high degrees of initial stability (to cope with sailing loads) that are inherent in our sailing designs. This has allowed us to fine tune hull shapes for more efficient powering – with a significant increase in comfort on passages with head and beam seas. Comfort on long offshore passages. Ability to deal with extremes of wind and sea. Ocean crossing range at an 10-to 11-knot cruising speed. Self righting (full recovery from a wave induced capsize). Smooth ride in tradewind head seas. Systems which allow us to sit at anchor for days without using the generator. Easy to leave the boat in storage for extended periods. 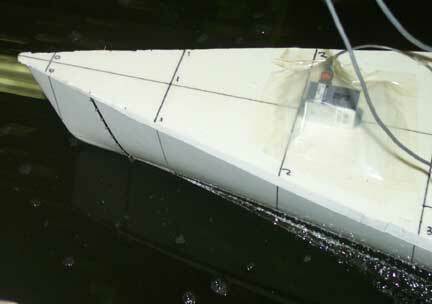 The photo above is a first look the FPB 64. This is a 64 foot (20m) version of Wind Horse. You will find more information on this, and our newest designs, in subsequent web pages. There’s a type of power boat from the past that is similar in its sea-keeping and performance to this “Unsailboat”. This is the early pilot boat from the era before big engines. These craft were fast and exceptionally seaworthy. Hence the acronym “FPB” (Fast Pilot Boat). In the following pages (listed in the FPB section of this site) we’ll outline for you the logic behind this FPB Series. You will find information on our goals for these boats, the naval architecture and engineering that underlies the construction, and large amounts of information on the systems. 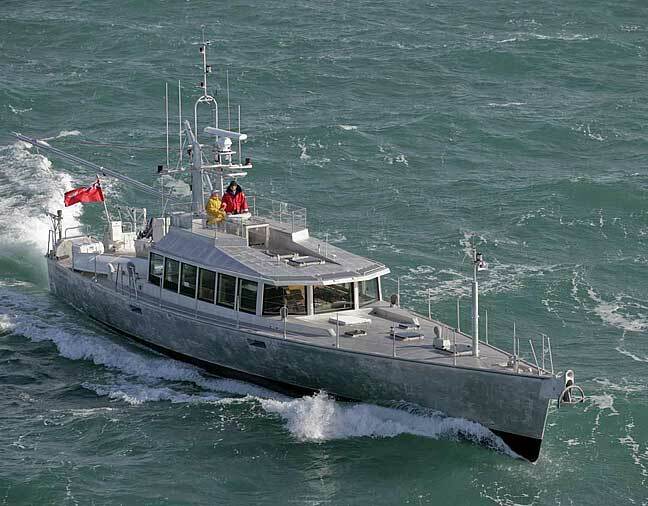 Towards the end you will find information on our sea trials, and how the 83 foot prototype has performed during the 45,000 miles of cruising she has accumulated since launching. Although we’ve discussed the design concepts and approach to hydrostatics in detail, with many different images, we have not disclosed the actual shape of the hulls. Given the ease of transmitting data these days, to do so would simply invite copying. And while we’re not adverse to competition, we see no reason to teach the rest of the marine industry what has taken us a lifetime of design work and hundreds of thousands of sea miles to learn. So although the hull shapes included are generally representational of what we’re doing, they are not the actual hull shape – details of which shall remain quietly under wraps for as long as possible. Heavy weather is very much a relative term. What might be considered a severe storm by someone just starting out is often just an uncomfortable gale, to be endured for a day or so, to a more experienced cruiser. Our definition of heavy weather, what we’ve aimed this design towards, consists of the truly dangerous storms of the higher latitudes. The reason for this approach is simple. The better we are at handling really awful weather, the more comfortable we’ll be at sea the rest of the time. For an idea of what we’re talking about you may want to check out our book Surviving the Storm. 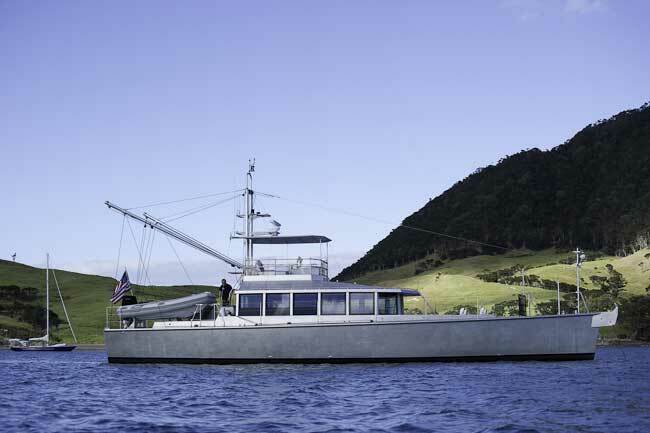 If you check out the passage notes about our shakedown cruise from New Zealand to Fiji, you will get an idea of the benefits of this approach. Although we purposely departed New Zealand in gale conditions, with confused, breaking seas (to test the boat) we were very comfortable and able to average over eleven knots for the passage. It is worth repeating that all of the design and engineering issues which help in severe weather also make the boat more user-friendly in the moderate weather than prevails 99.99% of the time. There are several major ingredients involved in both heavy weather capabilities and normal ocean crossing comfort. The first is staying out of trouble. 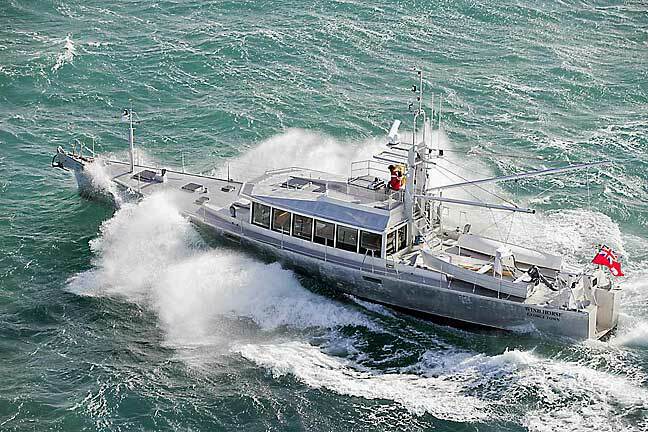 With high average sustainable speeds, the FPB can do a very good job of picking the right part of the ocean to be in, avoiding unpleasant conditions in the process. You can run downwind at speed, with the autopilot steering, in a high degree of comfort, with conditions that would find other yachts hove to. 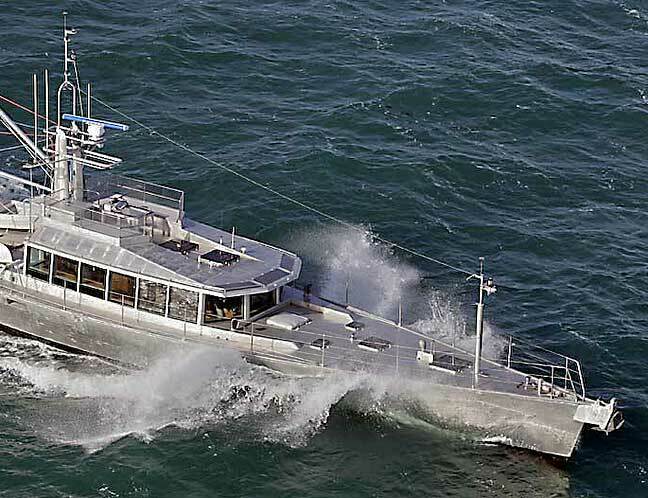 The FPB surfs at high speed, totally under control, with none of the tendencies toward broaching that are commonly associated with surfing on motor yachts. You also have the hull shape, structure, and power to punch through big seas (above Wind Horse, the first of this series, is doing 12+ knots) if you need to get somewhere in a hurry. And if your destination is upwind, this shape takes you through the waves with minimum fuss (for more on this ability look at our passage notes between Fiji and California, 85% of which was uphill). Fast passages mean less exposure to the vagaries of weather. The second ingredient is steering control. Good directional control makes for a much more comfortable boat in normal weather, and gives you a wide array of storm tactics to employ, if needed. We also need to consider what happens if the worst were to occur, if the boat were caught at the wrong angle by the wrong breaking wave. 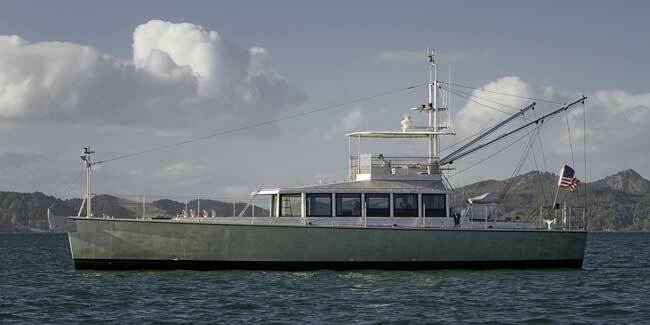 Unique in the world of oceangoing motor vessels, the FPB Series are self-righting. In other words, they will recover from a full capsize. In fact, the inverted stability curves on these vessels is more favorable than what you will find on our sailing designs. Of course, the main object is to avoid this situation entirely. If you want to see what we are designed NOT to do, check out this video on YouTube. This is a graphic example of what happens to the majority of commercial and yacht designs when caught by an unexpected breaking crest. We’ve learned from many years of designing and building ocean-crossing yachts, and from our own experience, that vessels that are comfortable at sea tend to go places. Yachts that are hard on their crews stay closer to home. All of the vessels we’ve designed to date are optimized for passaging – which is why so many circumnavigations have been done in them. 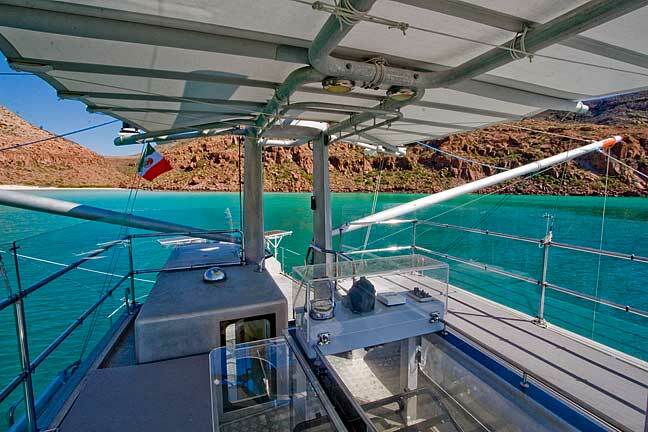 A very large percentage of the passages for a serious cruiser will involve head winds and head seas. That is a major reason for the hull shapes we’ve refined over the years in our sailing yachts – to keep comfort levels acceptable when passaging uphill (our sailing designs power straight into the wind and sea more comfortably and faster than comparably-sized trawlers). With the FPB series, the elimination of the need for stability to carry sail means we can have an even more comfortable hull shape, one which has allowed the FPB 83 to make good through the water at 11 knots while fighting head seas between Fiji and California. You will find a series of articles about the tank testing and the computational fluid dynamics analysis which we undertook to verify our calculations. While this is now history – we know how the boat performs – the process itself may be of some interest to you. We’ll then take you through the structural engineering process and how we use the Lloyds Special Service Rule (All Oceans category). 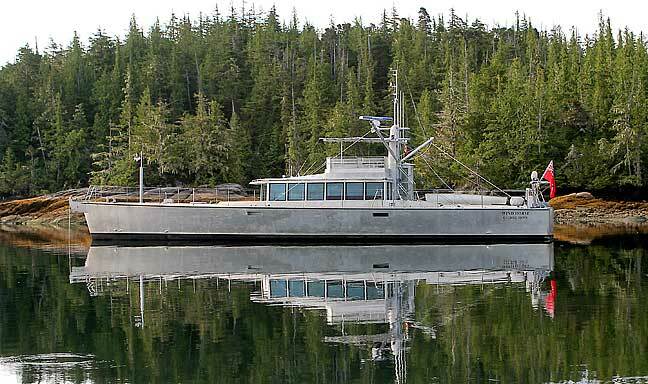 The remaining articles cover details of maintaining an aluminum hull, our glazing system, and discussion of hull appendages. When it comes to cruising interiors we’ll admit we’re spoiled. As you will have seen in the photos of some of our other designs elsewhere on this web site, we are used to very nice surroundings when afloat. En route, and upon arrival, we expect to fully enjoy a beautifully crafted and functional array of living space. 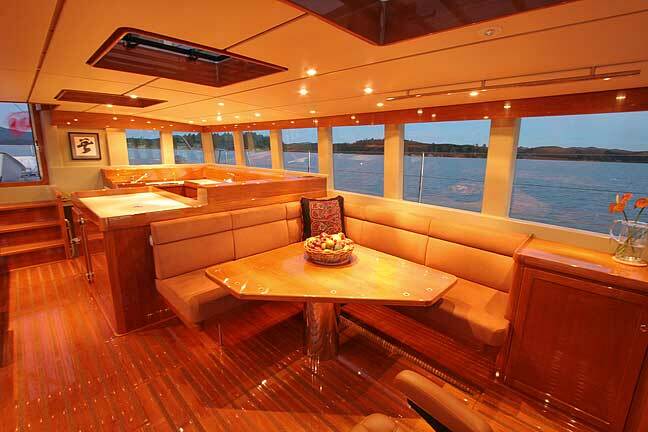 The interior layout of the FPB series (the FPB 83 is shown above and below) has all of the main living and watch standing functions centered in the saloon. This keeps crew and watch standers together, which we much prefer. We can eat meals together, or just sit around chatting while keeping watch. After 45,000 miles of usage we can tell you this layout works really well, and the 360 degree views for watch stander, whomever is working in the galley, and while just hanging out, are a joy to live with. In the articles focusing on interior, we’ll explain the logic behind the layout, and how the interior works at sea as well as in port. You’ll find detailed drawings and renderings for the furniture and storage systems. Storage capacity for two large dinghies. A pair of booms for easy launching and retrieval of the dinghies, and for use as a back up to the active stabilizers offshore. A flying bridge which is comfortable and well enough protected so that is has become our favorite location for standing watch. Powered winch for handling drogues, warping, and docking. Series of deck winches to aid in shorthanded docking situations when the breeze is against us. All of these features are designed to make the boat easy to handle, in good weather and bad, for her owners working as a couple. 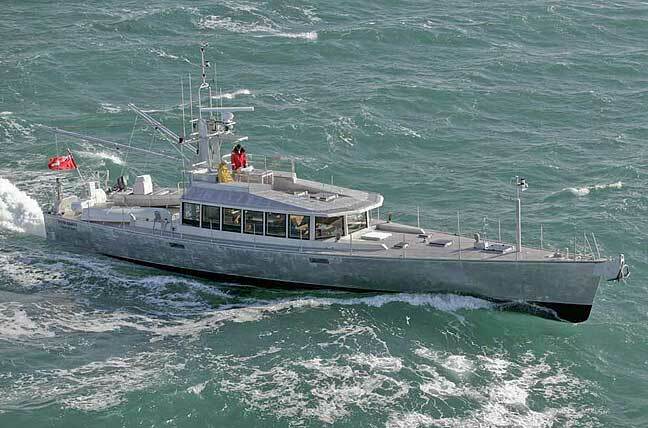 The flying bridge area on the FPB Series is relatively close to the pitch and roll center of the hull. As such, motion at sea is moderate, and this area has proven to be the center of many pleasant hours en route as well as at anchor. The awning shown is for tropical climates. In more temperate climates the forward half of the awning is stowed. And for inclement weather we have clear plastic “weather clothes” protecting the crew from wind and spray. Finally, there is a section of articles which discusses our “jury rig”. With twin engines it is unlikely we’ll ever need this. But we still want to know that we can make our way to port without outside assistance, should we have a total failure of both drive lines. 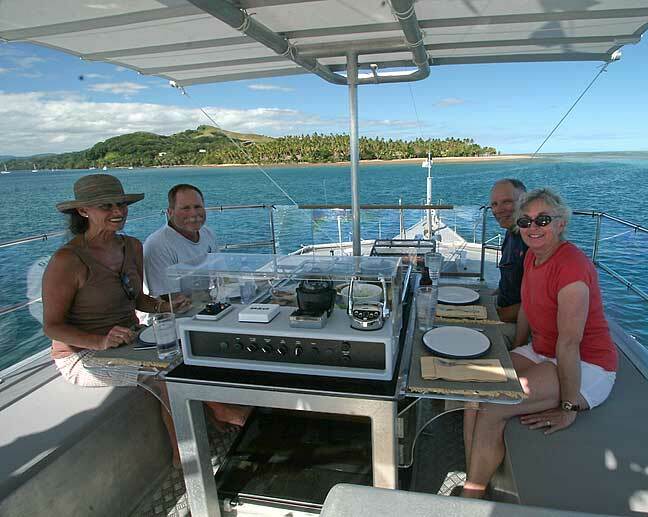 Systems design and installation are at the heart of an enjoyable cruising experience. Done properly, maintenance (and frustration) are minimized, while a very high level of ambiance is maintained. 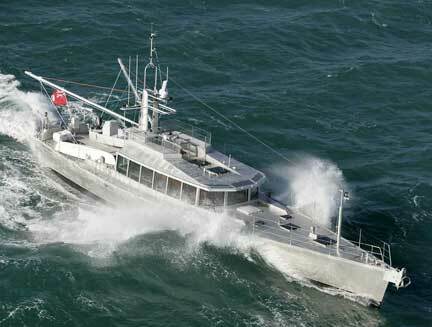 The FPB systems enable us to sit at anchor for days without the need to run engines or genset for power. And when we do run the generator, it is so quiet that you have to strain to hear it running. In the systems series of articles we’ll take you through the logic of how we have set this boat up, describe how the systems interact, and how they are installed. If nothing else, these will give you a glimpse into the approach we’ve been honing for the past 25 years. 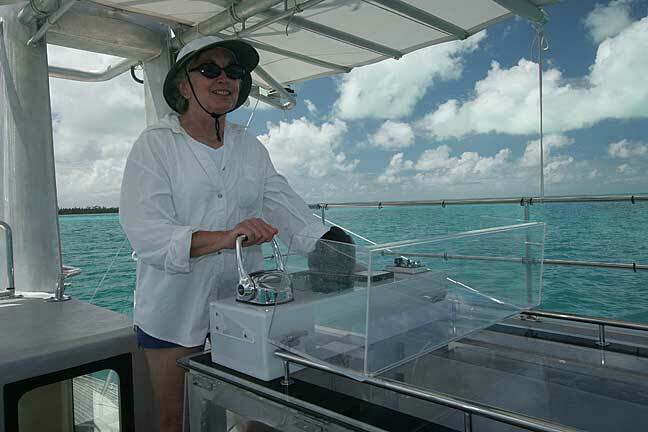 At sea, we can run air conditioning and water maker without using the generator. At the top of the sidebar you will find a heading called “Recent Press”. Here you will find editorial reviews and comments on this new approach to ocean crossing. Most of these are by journalists who have actually been aboard for a real world trial. The comments make for interesting reading. Now that we’ve cruised the “Unsailboat” from New Zealand to California, to Alaska, Mexico, back to Alaska and now California to the U.K via Panama and Greenland, and on to Norway, Svalbard to 80 degrees North, we’ve had a chance to evaluate how it meets our design goals. 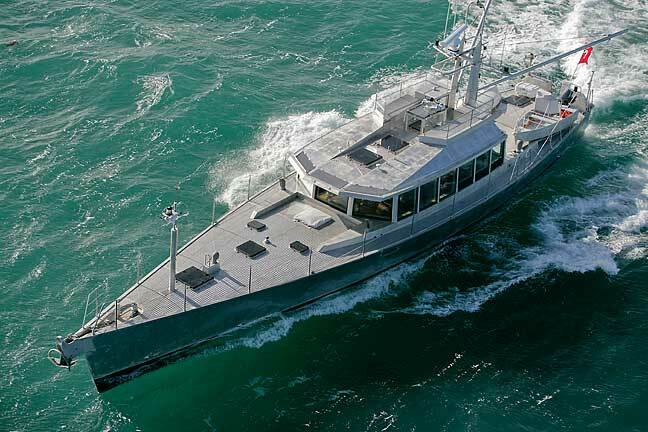 There are lots of details on what we’ve learned throughout this web site The bottom line is that this boat is much easier to cruise than our sailing designs, handles heavy weather better, and is far more comfortable when crossing oceans. And the operational costs on a per mile basis are substantially less than what we’re used to with sail. 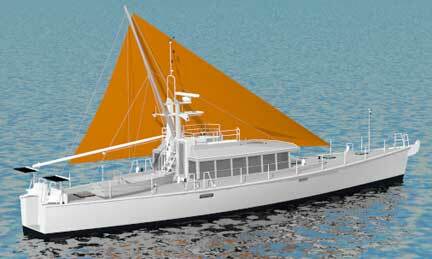 The “Unsailboat” will spoil (and convert) the sailing purist… it has certainly done that to us. If the FPB Series approach to cruising appeals, and you want to look further into the concept, contact us by e-mailingSue Grant: Sue.Grant@Berthon.Co.UK. After wading through all of the above, and the detailed FPB web pages, if you would like more information on what we do check out the rest of the Dashew Offshore history. Here you will find hundreds of photos of our different designs from around the world. This entry was posted on Thursday, January 26th, 2012 at 6:12 pm and is filed under Dashew Offshore, Intro to FPB Program, one. Both comments and pings are currently closed.